Centrally located in the heart of The Great Waters, Newberry is nestled deep in the beautiful Lake Superior State Forest - a forest full of lakes, streams, woods, and wetlands. A forest where wildlife abounds: birds and fish are plentiful. A forest just waiting for you to come and enjoy its many wonders. Magnificent Lake Superior is the northern border of the Newberry area. 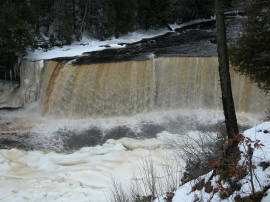 On the east is Tahquamenon Falls, the largest waterfall east of the Mississippi outside of Niagara Falls. On the west, the 95,000 acre Seney National Wildlife Refuge, and to the south is the town of Newberry with plenty of lodging, food, shops and stores. Visitors to Newberry enjoy easy day trips to the magnificent Tahquamenon Falls, historic Crisp Point Light House, the breathtaking beauty of the Two Hearted River, and the adventure of Oswald's Bear Ranch.